Does the Nobel Peace Prize REALLY Mean a Damn Thing Anymore? 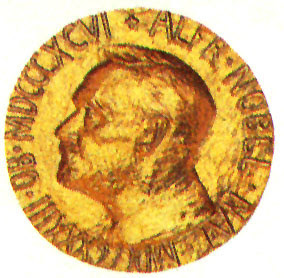 Any of the prizes awarded annually by four institutions (three Swedish and one Norwegian) from a fund established under the will of Alfred B. Nobel. The will specified that awards should be given “to those who, during the preceding year, shall have conferred the greatest benefit on mankind.” Since 1901, prizes have been awarded for physics, chemistry, physiology or medicine, literature, and peace; since 1969, a sixth prize, established by the Bank of Sweden, has been awarded in economic sciences. The Nobel Prizes are regarded as the most prestigious prizes in the world. After Al Gore won his Academy award for his schlockumentary “An Inconvenient Truth” and the buzzing first started about the possibility of him winning the Nobel, anyone with any brains knew it was a foregone conclusion. That’s NOT meant as a compliment. Then he won the Emmy. And, of course, now the Nobel. The man is a whiner of the first order–first with his bawling about the 2000 elections and his ORDERING a Florida official to BREAK THE RULES in the vote counting, rules well established in that state’s constitution. It took the Supreme 9 to shut him the hell up and we’re still hearing how Bush “stole” the election. Then his quavery voice on his latest Chicken Little “The Sky is Falling” crusade. Trouble is, his film is not scientifically credible. Global warming is not the catastrophic, impending doom he would like us to believe and what he has scare-mongered the weak minded into thinking, including Hollywood and anyone on the left. Of course, he has stooped to the “Vast Right Wing Conspiracy” when any credible scientist has questioned his disaster of a movie, screaming the right has “bought them off”. Too bad he couldn’t buy off the British government and court system. A british court ruled his movie represents “partisan political views” and requires a school disclaimer before being shown in schools. “Al Gore’s movie, An Inconvenient Truth, represents ‘partisan political views’ and must be treated as such by teachers in British schools, a British High Court judge has indicated. “The British court was swayed by numerous factual inaccuraciesportrayed in the movie. anymore or has it become simply a political popularity contest? Theodore Roosevel  (President of the United States of America. Thomas Woodrow Wilson  (President of the United States of America. Charles Gates Dawes  (Vice-President of the United States of America. Andrei Dmitrievich Sakharov  (Soviet nuclear physicist. the definition of the Nobel Prize Laureates. LE DUC THO , Democratic Republic of Viet Nam. for jointly negotiating the Vietnam peace accord in 1973.
for jointly negotiating peace between Egypt and Israel. Paul II and Margaret Thatcher??? for their efforts to create peace in the Middle East. These "laureates" are a rogue's gallery of simple political panderers. Arafat? Gorbachev? Carter? Now, Gore. Sad commentary on what was once a very "Nobel" idea. Filed under: Gore, Miss Beth, Nobel |	Comments Off on Does the Nobel Peace Prize REALLY Mean a Damn Thing Anymore?